This MFL CO2 Cryo Jet remains industry standard when referring to CO2 Jets, it remains most common on the market. With its compact size this machine can shoot a high stream CO2 cloud column which reaches heights of 16-26 feet and about 4-6 feet wide. - This MFL Jet was designed with our quick lock CO2 hose system for easy setup & breakdown. The base plate has holes so it can easily be hung from truss, installed on a stage or hung from a ceiling. No more need for sand bags or clamps during productions, our CO2 Jet is weighted ready to be used. - These jets have capabilities to be linked to other units for simultaneous control of multiple jets. It has built in DMX 512 allowing your creativity to shine by connecting it with any DMX console or lighting software, truly making the CO2 effect different. DMX controlled with 2 channels (on/off control and length of "ON" before the jet shuts off). When you have multiple units, you can create different effects like delays or chases. Besides DMX you can also control it with standard power switch on/off capabilities. - They also significantly cool down your venue very quickly. The CO2 cloud vanishes in seconds after the user stops activation. Wire-control: Connect the power, and press the power control switch, the CO2 gas column up at once. DMX512 Signal Control: Press the"DMX" switch, there are two channels under the DMX512 signal: Push the first channel, the machine will continue 1 second CO2 column; Push the first and second switch together, will Continue 3 seconds CO2 column. DMX CONTROL: The MFL Stationary CO2 Jet is DMX controlled or standard power on/off switched. When the fixture receives power, the valve will open. This is useful for use with a relay pack, power strip, or any other controllable power source. EFFECT: This CO2 Cryo Jet projects a 16-26 feet high plume of CO2. 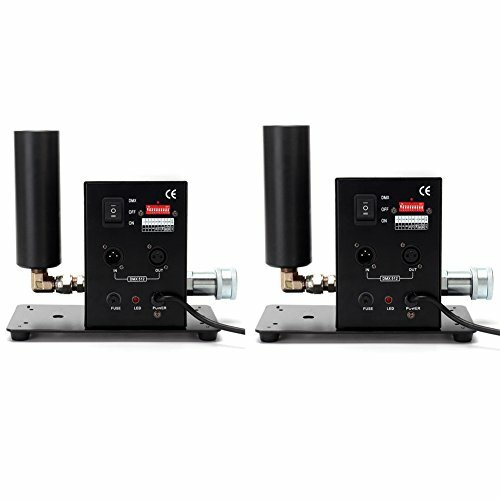 Control your CO2 Cannon with DMX, or with any controllable power source.